From the Baldwin County Courthouse, go west on Hancock Street for 2 blocks or 0.2 mile (or the one large block containing Georgia College & State Univ.). Turn right on Clarke Street. Go one large block or 0.2 mile. Turn left onto Business Highway 441 North (Montgomery St.) and follow the signs for Business 441 N (turn right on North Columbia St.). Go approximately 7-1/2 miles. Turn left at Meriwether Rd. About 2.8 miles further (about 2 blocks past Georgia Power overhead lines) turn right onto Forte Dr. where Meriwether Road curves left. If Forte divides, stay to the left. 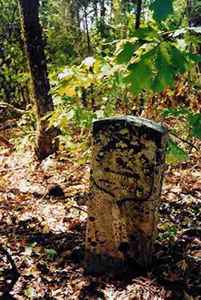 Marker is just past the divide and 0.3 mile from Meriwether and Forte Dr. intersection, on the left, about 15 feet from the road. Several depressions and one upright very old stone. A more recent grave - possibly a dog's grave.